We’d love your help. 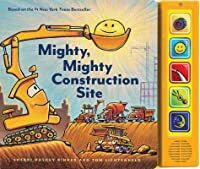 Let us know what’s wrong with this preview of Mighty, Mighty Construction Site by Sherri Duskey Rinker. To ask other readers questions about Mighty, Mighty Construction Site, please sign up. I read this book out loud eight times today. My kid loves it. 5 mighty trucks are all set to construct the biggest buildings ever. But their excitement comes to an end when they see another building bigger than they can build. Until they have some of their friends helping them up, the work is no fun. Be ready to have an amazing ride because "These pals move mountains everyday!" Out on the construction site, five trucks are waking up. When they roll out the plans, they discover the job is bigger than they can handle. Cement Mixer thinks fast and honks his horn to call for more help. Five more trucks arrive to assist. Soon the ten trucks are working together to build the big building. Rhyming text keep readers glued to the construction of a tall building. The illustrations are active and colorful. The reader will follow the text with the pictures. 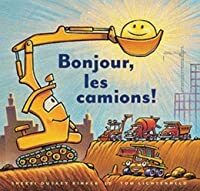 This book is about frien Out on the construction site, five trucks are waking up. When they roll out the plans, they discover the job is bigger than they can handle. Cement Mixer thinks fast and honks his horn to call for more help. Five more trucks arrive to assist. Soon the ten trucks are working together to build the big building. *happy sigh* I really love these books. Didn't expect to learn anything as I was turning the pages, but now I know the names of some of the trucks AND how cement gets up to make the floors in a building! Pretty nifty! This is a great sequel to Goodnight, Goodnight, Construction Site. The last two double pages are almost the same, but in the rest of the book we hear more about the trucks' day, and they are joined by some additional trucks to build a structure. There is an emphasis on hard work and cooperation. Definitely would be enjoyable for kids who liked the first one. 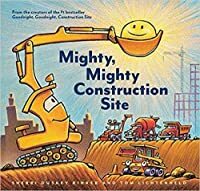 Children's book about what happens on construction sites. A little long for Storytime; would work well with kids on parents laps. Another great book for kids who love things-that-go! Lichtenheld's artwork is just as intriguing and instructive, and Sherri Rinker's rhymes are just as appealing as in GOOD NIGHT, GOOD NIGHT, CONSTRUCTION SITE. In MIGHTY, MIGHTY CONSTRUCTION SITE the guys are back with a new project, and it's so HUGE that they need help. This allows Rinker and Lichtenheld to introduce a whole new group of trucks. There's now a Skid (who breaks up boulders), an Excavator, a Crane truck, a Pumper and a Flatbed that join in the fun. Besides the rhymes, which make for a good Read-aloud, I love that there are words such as 'intense' and 'immense' and 'nimble' to help broaden children's vocabulary. The introduction of new equipment will, of course, intrigue children who liked the first book. But it also gives us adults a chance to talk about the different elements and stages of construction, and the fact that teamwork is important. In fact, in this book the author takes the opportunity to show the trucks working as teams. 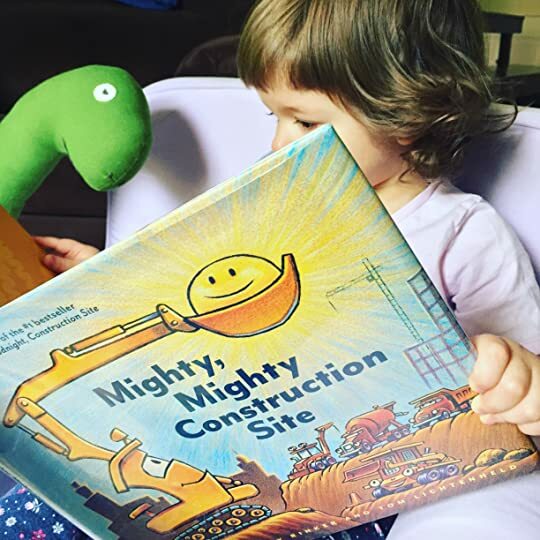 MIGHTY, MIGHTY CONSTRUCTION SITE is a fun followup to the first book. it's hard to follow up a long time best seller with another stellar book but that is what this pair have done. With a natural rhyme full of important details about the differing roles of all the trucks that are needed on a construction site and woderfully active illustrations that give a personality to each truck described, Rinker and Licthfeld have created another winner. Young readers will pour over the illustrations and also learn about the job of each truck. There is some mystery....what tru it's hard to follow up a long time best seller with another stellar book but that is what this pair have done. With a natural rhyme full of important details about the differing roles of all the trucks that are needed on a construction site and woderfully active illustrations that give a personality to each truck described, Rinker and Licthfeld have created another winner. Young readers will pour over the illustrations and also learn about the job of each truck. There is some mystery....what truck is coming over the hill, and lots of pleasure. A welcome addition to this series and as good as the very first book. Love the message of teamwork and cooperation, and the insights into what all those machines are and what they actually do at a construction site. I like this one better than the first book! The creators of the beloved Goodnight, Goodnight, Construction Site are back to show us how big trucks start their day on the construction site. Rhymes and a catchy reading rhythm give energy to the lives of these trucks as they begin their biggest building project yet. The project is so big, they need to call in some friends for help and form a supercrew, working together to get the job done. Almost any book with trucks in it is a winner in my son’s eyes, but this is certainly one of the better ones from a parent’s perspective (you know, the read it over and over and over perspective lol) I picked this up on my library’s discard/sale shelf for 50 cents and now I need to keep my eye out for a copy of Goodnight, Goodnight Construction Site from this author/illustrator duo too. This was a 3.5 stars for me. We love Goodnight, Goodnight Construction Site, so I thought this would be no different. However, it’s actually rather lengthy and my toddler lost interest about 3/4 of the way through. I assume he will love this one more going into ages 4 & 5. I did LOVE that this book contained some “she” machines. This is what Goodnight, Goodnight Construction Site should have been. The rhyme scheme and pacing hasn't changed - it's stellar - and the illustrations retain the same soft charm. The difference lies entirely in the addition of a few genderless as well as a few "she" trucks (and there are no false eyelashes in sight). While I like the "Goodnight" concept of the original, this one features a day in the life of a variety of construction trucks, with a short goodnight moment at the end. That, combin This is what Goodnight, Goodnight Construction Site should have been. The rhyme scheme and pacing hasn't changed - it's stellar - and the illustrations retain the same soft charm. The difference lies entirely in the addition of a few genderless as well as a few "she" trucks (and there are no false eyelashes in sight). Glad that some of the trucks are "she". Hello, friends! Our book today is the charming Mighty, Mighty Construction Site, written by Sherri Duskey Rinker and illustrated by Tom Lichtenheld, a fun and informative story about construction vehicles, cooperation, and teamwork. The team from Goodnight, Goodnight Construction Site wakes up to a brand new day, stretching, fueling up and getting ready to build. When they unfurl the blueprint, they are in awe; it’s their biggest project yet! They’re not sure that their little five-vehicle team can do it alone, so they call in help: a whole fleet of construction vehicles and heavy machinery! All the machines work together to build their project, each one bringing something special to the job. And when the day is done, they may be worn out, but by working together, they’ve gotten the job done in no time flat. This was a phenomenal book for little readers who are interested in big vehicles! In cheerful rhyming text, each machine is named and has a description of the function they perform, including some trucks I’d never even heard of! I also love that beyond the vehicles themselves, hard work and cooperation are stressed as main themes, showing children that everyone brings something to the table and working together is the best way to achieve one’s goals. The illustrations are adorable, and give endearing personality to each machine. The length is good, and JJ and I enjoyed it! Rinker and Lichtenheld’s collaborations are always a delight, and this one does not disappoint. Baby Bookworm approved! This successor to Goodnight, Goodnight, Construction Site will appeal to any kid with an interest in big trucks. In rhymed couplets, Sherri Duskey Rinker takes us step by step through constructing the beginnings of a new building, showing every truck involved in the process. There is a strong message of teamwork here. Every truck has its equal part to play in getting the job done. I really appreciate the variety of trucks included. There were several (skid steer, pumper) that I'd never heard of, This successor to Goodnight, Goodnight, Construction Site will appeal to any kid with an interest in big trucks. In rhymed couplets, Sherri Duskey Rinker takes us step by step through constructing the beginnings of a new building, showing every truck involved in the process. There is a strong message of teamwork here. Every truck has its equal part to play in getting the job done. I really appreciate the variety of trucks included. There were several (skid steer, pumper) that I'd never heard of, and most kids will enjoy learning a few new trucks to add to their repertoire. Rinker introduces some great new vocabulary as well (underway, nimble, churns, to name a few), and is especially good at incorporating clues in the text to help kids guess the meaning of unfamiliar terms. For instance, "The plan's unrolled. They stare in awe-/ The biggest thing they ever saw./ A massive building, so immense-/ this giant job will be intense!" does a fantastic job of teaching synonyms for "big." The book itself is probably a bit too long for most storytime groups, but would still work well for one-on-one reading. It's difficult to develop a new concept for a sequel or companion book that matches the charm of the original -- particularly one that is a wildly popular NYT bestseller. Rinker and Lichtenheld have done exactly that without rehashing content from their wildly popular "Goodnight, Goodnight, Construction Site". The five trucks from the first book (Bulldozer, Cement Mixer, Crane Truck, Dump Truck and Excavator) are to construct a new building, but realize they are going to need help. Dump Truck se It's difficult to develop a new concept for a sequel or companion book that matches the charm of the original -- particularly one that is a wildly popular NYT bestseller. Rinker and Lichtenheld have done exactly that without rehashing content from their wildly popular "Goodnight, Goodnight, Construction Site". 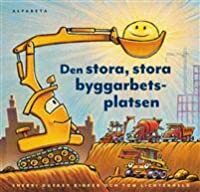 The five trucks from the first book (Bulldozer, Cement Mixer, Crane Truck, Dump Truck and Excavator) are to construct a new building, but realize they are going to need help. Dump Truck sends out a call that is heeded by a group of five different trucks (Crane, Flatbed, Front-End Loader, Pumper, and Skid). Each new truck is paired with one on the job. The function of each new truck is explained as it works in tandem with its partner. At the end of the day, the new crew returns home and our five intrepid heroes tuck themselves in for the night. Never cloying, much information about the different trucks can be found in the smooth rhyming text. Liochtenheld's Neocolor wax oil pastels on Mi-Teintes paper artwork is just as charming and fresh as the artwork for the first book in the series. A must -- particularly for those who just can't get enough of all things truck! Synopsis: "At last—here from the team behind the beloved international bestseller comes a companion to Goodnight, Goodnight, Construction Site. All of our favorite trucks are back on the construction site—this time with a focus on team-building, friendship, and working together to make a big task seem small! Down in the big construction site, the crew faces their biggest job yet, and will need the help of new construction friends to get it done. Working as a team, there's nothing they can't do! Synopsis: "At last—here from the team behind the beloved international bestseller comes a companion to Goodnight, Goodnight, Construction Site. All of our favorite trucks are back on the construction site—this time with a focus on team-building, friendship, and working together to make a big task seem small! Down in the big construction site, the crew faces their biggest job yet, and will need the help of new construction friends to get it done. Working as a team, there's nothing they can't do! The millions of fans of Goodnight, Goodnight, Construction Site are in for a mighty good time!" When the construction team wakes up in the morning, they'll need some help from their friends to get their new job done! This was cute and would work well in a storytime. The text is short and rhyming, introducing new construction-related vocabulary. We are reintroduced to the friends we met in Goodnight, Goodnight Construction Site and some new equipment too. I like that each piece of equipment works with another piece in order to complete his or her task. You could talk about the importance of When the construction team wakes up in the morning, they'll need some help from their friends to get their new job done! These trucks are ready for action when they go to the construction site for the day! They are given a job that just may require a little help from some friends. These trucks all work together so hard and skillfully that their once giant task doesn't seem so giant anymore. Each student will reflect on a time that they needed help with something wether it be from a friend, parent, teacher etc. and they will write a short story about this time using rhyming words just as in Mighty, Mighty Construction Site. By doing this, students are using those creative gears to tell a non-fiction story about their own lives. Also enjoyed reading this book (a cute companion book to Goodnight, Goodnight) and has a lot of great things to say about teamwork. This book continues my peeve of "cement mixer" - no it's a concrete mixer, it even uses concrete correctly in the part where the mixer and the pumper have to work together but the illustration says "wet cement" ugh! come on. This book does have some female trucks - which is nice and something I wish that would have been included in the first book as well, so props t Also enjoyed reading this book (a cute companion book to Goodnight, Goodnight) and has a lot of great things to say about teamwork. This book continues my peeve of "cement mixer" - no it's a concrete mixer, it even uses concrete correctly in the part where the mixer and the pumper have to work together but the illustration says "wet cement" ugh! come on. This book does have some female trucks - which is nice and something I wish that would have been included in the first book as well, so props there. Overall good rhyming, sweet story, great illustrations. Fans of Goodnight, Goodnight Construction Site are sure to be thrilled with this sequel. Five mighty trucks wake up in the morning revving their engines and gearing up for the day. They meet in the construction yard where they dig trenches, break up boulders, haul dirt, lift beams and pour cement. Illustrations look similar to colored-pencil drawings, making them feel familiar and accessible to kids while also being crisp and detailed. It’s a fun addition to the first book, and it’s sure to appe Fans of Goodnight, Goodnight Construction Site are sure to be thrilled with this sequel. Five mighty trucks wake up in the morning revving their engines and gearing up for the day. They meet in the construction yard where they dig trenches, break up boulders, haul dirt, lift beams and pour cement. Illustrations look similar to colored-pencil drawings, making them feel familiar and accessible to kids while also being crisp and detailed. It’s a fun addition to the first book, and it’s sure to appeal to your child’s wonder at how things work. Go around the room and share a way you helped a friend, parent, teacher today. How does it make you feel to help someone? (discussion) We’re going to demonstrate scenarios in which you could help someone. A few classmates will come up and demonstrate a scenario then choose someone to come up and figure Down in the big construction site, the crew faces their biggest job yet, and will need the help of new construction friends to get it done. Working as a team, there's nothing they can't do! Go around the room and share a way you helped a friend, parent, teacher today. How does it make you feel to help someone? (discussion) We’re going to demonstrate scenarios in which you could help someone. A few classmates will come up and demonstrate a scenario then choose someone to come up and figure out how they can help out. Explain the scenario and what/how you helped? At last, here from the team behind the beloved international bestseller comes a companion to Goodnight, Goodnight, Construction Site. All of our favorite trucks are back on the construction site--this time with a focus on team-building, friendship, and working together to make a big task seem small! Down in the big construction site, the crew faces their biggest job yet, and will need the help of new construction friends to get it done. Working as a team, there's nothing they can't do! The milli At last, here from the team behind the beloved international bestseller comes a companion to Goodnight, Goodnight, Construction Site. All of our favorite trucks are back on the construction site--this time with a focus on team-building, friendship, and working together to make a big task seem small! Down in the big construction site, the crew faces their biggest job yet, and will need the help of new construction friends to get it done. Working as a team, there's nothing they can't do! The millions of fans of Goodnight, Goodnight, Construction Site are in for a mighty good time! Subject: Construction equipment -- Juvenile fiction. We liked the first book, good night good night construction site, so we were happy to see this one. It has a good bedtime ending too, so it can be easily read as a bedtime story. Kids voted to give this 5 stars. August 2017 - a guaranteed hit for any fan of Rinker's other books - it has the same bouncy rhyme and focus on what the vehicles do. This time they're joined by five other vehicles to build something (the beginning of a building? A piece of modern art? I have no idea) so there's a focus on teamwork. A couple of the new vehicles use female pronouns, which is a tiny step towards balancing out the cringe-inducing masculinity of the original five. Ben loves it. Sherri has returned to her passion of writing to indulge her own children's passions. A graphic designer, she lives in Chicago with her photographer husband, a cockapoo named Quincy, several fish, a few hermit crabs, an ever-changing array of insects in jars, toys in every corner, and two energetic and inquisitive young boys: one fascinated by bugs and magic and another obsessed with trucks and tr Sherri has returned to her passion of writing to indulge her own children's passions. A graphic designer, she lives in Chicago with her photographer husband, a cockapoo named Quincy, several fish, a few hermit crabs, an ever-changing array of insects in jars, toys in every corner, and two energetic and inquisitive young boys: one fascinated by bugs and magic and another obsessed with trucks and trains. She's constantly inspired -- and often exhausted! She created GOODNIGHT, GOODNIGHT, CONSTRUCTION SITE in hopes of happier bedtimes and sweet dreams for all.